Tina Fey accepts the Mark Twain Prize. Tina Fey: The Kennedy Center Mark Twain Prize aired on PBS stations nationwide on November 14, 2010. A lineup of top entertainers, including Fred Armisen, Steve Carell, Jimmy Fallon, Jon Hamm, Jennifer Hudson, Steve Martin, Seth Meyers, Lorne Michaels, Tracy Morgan, Amy Poehler, Betty White, and others, saluted Tina Fey at the 13th Annual Kennedy Center Mark Twain Prize for American Humor on November 9, 2010. Tina Fey is executive producer, head writer and star of NBC's three-time (2007, 2008, 2009) Emmy Award-winning comedy series 30 Rock, a workplace comedy where the workplace exists behind-the-scenes of a live variety show. Her performance as 'Liz Lemon' has earned Fey an Emmy, two Golden Globes, three SAG Awards and a People's Choice Award. In 2009, 30 Rock was nominated for a record 22 Emmy Awards, the most ever of any comedy series on television in a single season. 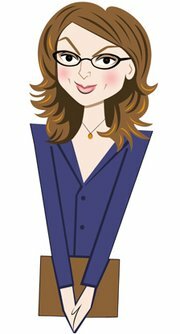 Tina Fey Prior to creating 30 Rock, Fey completed nine seasons as head writer, cast member and co-anchor of the Weekend Update segment on NBC's Saturday Night Live. Fey is an Emmy winner and two-time Writers Guild Award winner for her writing on Saturday Night Live and won an Emmy in 2009 for Guest Appearance by an Actress in a Comedy Series for her portrayal of Sarah Palin on the 2008-2009 season of SNL. Since her transition to being in front of the camera, she has won much acclaim, including being named The Associated Press' Entertainer of the Year in 2008, one of Entertainment Weekly's Entertainers of the Year on numerous occasions, one of People Magazine's "Most Beautiful People" (four times), and one of Time magazine's "Prestigious Time 100" (two times). 30 Rock has earned her three Emmy Awards for Outstanding Comedy Series, a Golden Globe for Outstanding Comedy Series, a SAG Award for Outstanding Performance by an Ensemble in a Comedy Series, two Writers Guild Awards for Outstanding Comedy Series and two Producers Guild Awards. She has also won two Gracie Awards and a Made in New York Award. Fey expanded to feature films in Spring 2004 as both a screenwriter and an actress in the hit comedy Mean Girls, which earned her a nomination for a Writers Guild Award for Best Adapted Screenplay. On the big screen, Fey most recently starred alongside Steve Carell in 20th Century Fox's hit comedy film Date Night and is a featured voice in the Dreamworks animated film Megamind with Will Ferrell and Brad Pitt opening in theaters nationwide in November. In 2008, Fey starred opposite Amy Poehler in the film Baby Mama for Universal Pictures. Fey is also in the process of writing her first book for publisher Little, Brown and Company, which is scheduled for publication in Spring 2011. Fey lives in New York with her husband, Jeff Richmond, and their daughter.